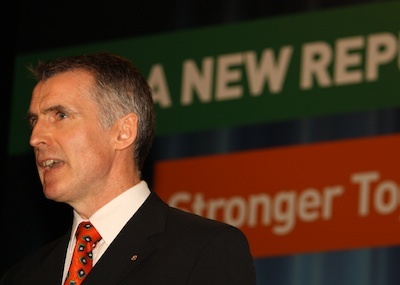 In an address to the Sinn Fein Ard Fheis this [Friday] evening, Declan Kearney examines the state of the political process in the north of Ireland. Huge advances have been made by our Peace Process since the GFA [Good Friday Agreement]. Politics and society across the island have benefited. However, the longer the legacy of the past; sectarianism and sectarian segregation; inequality and bigotry remain unresolved, they will entrench as barriers to reconciliation and a shared future. That context fuels a serious reality, which I acknowledge. Some within unionism are very angry. They perceive the Peace Process has disadvantaged them. They are seized by a fear. Fear can be real or imagined; but it needs to be heard and addressed when it exists. However, many republicans and nationalists are deeply frustrated with the unwillingness of some unionist leaders to embrace equality and power sharing. Most citizens north and south, support the Peace Process and want its work completed. They want real leadership shown by all Parties and the two governments. Those who persist with recriminations about the past in Leinster House, or the Assembly to make negative politics are misguided. Let me say this: the relentless campaign of vilification against the republican leadership, and specifically Gerry Adams in this state, is a disgrace, and should stop immediately. The blame game is a cul de sac, and it distracts from the serious work to consolidate the Peace. The Haass negotiations provided a mechanism to do that. Most people had real hopes for progress. That process proved compromise can be made on the remaining big obstacles facing the Peace Process. Our Party endorsed the Haass proposals, not because we got everything we wanted, but because they were a viable way forward for wider society. Leadership and compromise are flip sides of the same coin. Each are needed to make society work well. Realistically, some within and outside the Haass negotiations didn’t accept the need for compromise. Indeed, some sections of political unionism don’t want to compromise on anything. They should revisit the political legacy of David Ervine. Nonetheless, genuine, and principled leaders exist within different strands of political unionism. I have met them. The greater number in our society are not represented by the intransigence and sectarianism of the extremists. The decision by some to try and exert a veto at this stage in our Peace Process has the potential to create a vacuum. The two governments share a massive responsibility to stop that happening. Yet while reconciliation is absent, the pain, injustices, and resentment from our conflicts will remain. Sectarianism and sectarian segregation will deepen. Fear, mistrust and resentment will continue. These issues cannot be parked. They all fuel division and political instability. So we need a road map for reconciliation. A shared future for our children should not be imprisoned by our collective past. However, reconciliation is not an option. It is a moral, strategic and political decision to improve society. An inclusive public discourse is urgently required. The good will and resources of civic society need mobilised as part of that. Significant discussions are currently underway within the main churches, and among the business, trade union, academic, community and voluntary sectors about what we can all do, separately and together at this time. These are important conversations which need widened out to garner momentum and critical mass. The voice of civic society should no longer be marginalised from the Peace Process. A new Civic Forum should be re-established to that end. Sinn Fein believes an act of common acknowledgement by all sides, for the suffering inflicted and experienced by all sides, should be agreed, as a contribution to a healing process. Without grace, forgiveness or generosity there is no future. Respect and parity of esteem for our different identities and traditions must also be entrenched. Equality is not a sectarian, zero sum poker game. We share this space together and we are all different; but we are also equal; as Irish, British, republican, unionist, and, orange or green. Sectarianism has been used to subvert our island’s diversity with communal division. The cancer of sectarian attitudes or behaviour can no longer be ignored. It must be eradicated from the work place, schools, community, and the political institutions. A Bill of Rights should be introduced, and anti-sectarian legislation, including incitement to hatred provisions enacted. Our Party advocates the development of a dedicated reconciliation strategy, providing the scaffolding which supports the measures to tackle these remaining challenges. A defining point has been reached in the Peace Process. It is no longer an option to simply manage the Peace, while extremists peddle wreckers’ agendas. A new phase based upon reconciliation is needed. Only an authentic reconciliation process will foster the new relationships and trust we need. Madiba said it always seems impossible until it’s done. He proved that the seemingly impossible was achievable. We too can guarantee all our children a Rainbow future, and laughter instead of revenge, by making reconciliation possible, as the next phase of the Irish Peace Process.